Mountain & Water at Mountain and Water Outdoor Pursuits CentreRugged sea cliffs and sandy bays; imposing hills and hidden waterfalls; gentle meanders and crashing white water. Whatever you want you will be able to find it in the rich and varied landscape of Wales and the Welsh Borderland. 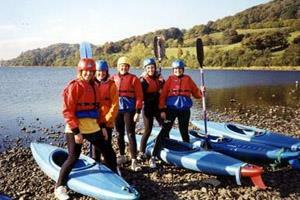 Our aim is relaxed and environmentally considerate enjoyment of the countryside through adventure. Individuals, families and groups of all kinds are welcome. Whatever your age or ability there are NO BARRIERS to taking part and we won't give you a hard time. Canoeing and Kayaking. Climbing and Abseiling. Caving. Walking, Orienteering and Wayfaring. Canoe Hire & Outfitting. Multi-Activity Breaks. Expeditions for Small Groups. Family Activity Holidays. Corporate and Team-Building. January - December. All bookings by arrangement.